It has been pointed out to me that I had a factual error in my January 7, 2015 column that appeared in the Eureka Springs Independent newspaper. The following is the corrected version. My wife Diane grew up where the Pig Trail Kart n Golf (formerly The Fun Spot) is located on Highway 62 East in Eureka Springs. If you go back to the early 1980s, it was still a beautiful family home place, with an abundance of flowers, bushes and large old trees around a house with a big yard. There was some pasture and Duane O’Connor sometimes ran a few cows. Diane and her brother Doug would play in the front yard and periodically a car would pull up and tourists would ask for directions to the Passion Play. After being given directions, the tourists would sometimes ask how many blocks away it was. Diane didn’t know how to answer that. I still remember his directions. I was to turn left at the red oak snag. I found it. I was to stay straight at the giant dead elm. I found it. I was to watch for the dogs at the house where the hippies grew dope. Those dogs found me before I found them. Lulabell and I made it through that section pretty quick. Looking back, I realize that she and I did a lot of trespassing without a second thought. Speaking of Grandpa and hippies, he told me once that he’d heard that there were hippies in Eureka that didn’t get out of bed until nine in the morning. He was incredulous. I’m glad he didn’t know what time I got up. For thirty years, O’Connor’s Texaco Service Station operated in Eureka Springs, Arkansas. 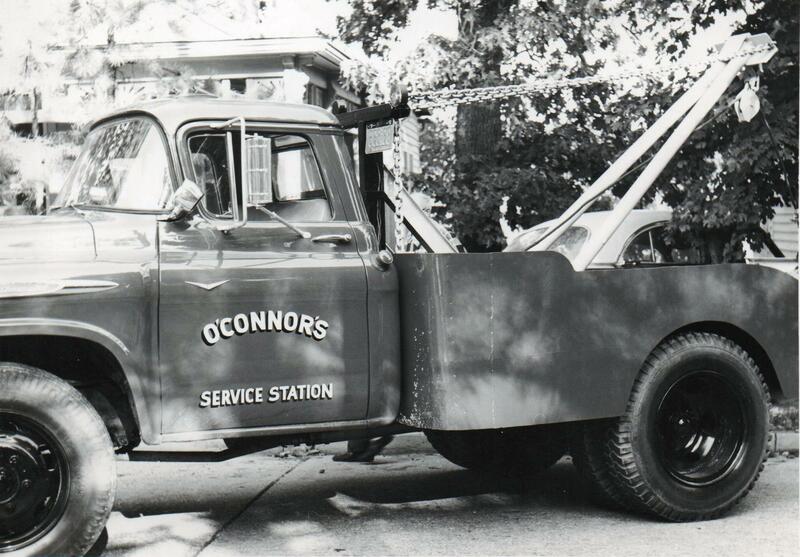 In about 1954, Duane O’Connor bought an old Dodge Power Wagon so they could offer a wrecker service, too. Over the years he bought a number of different wrecker trucks to be used in the business. The one pictured below is a 1955 model Chevrolet truck. He eventually sold this vehicle to Howard Weems. Duane operated the wrecker service until his back gave out in about 1980. In my little workshop building, there is a backroom I use as an office. I was sitting in there yesterday with the cat upon my lap, when in through the open door walked a young raccoon. 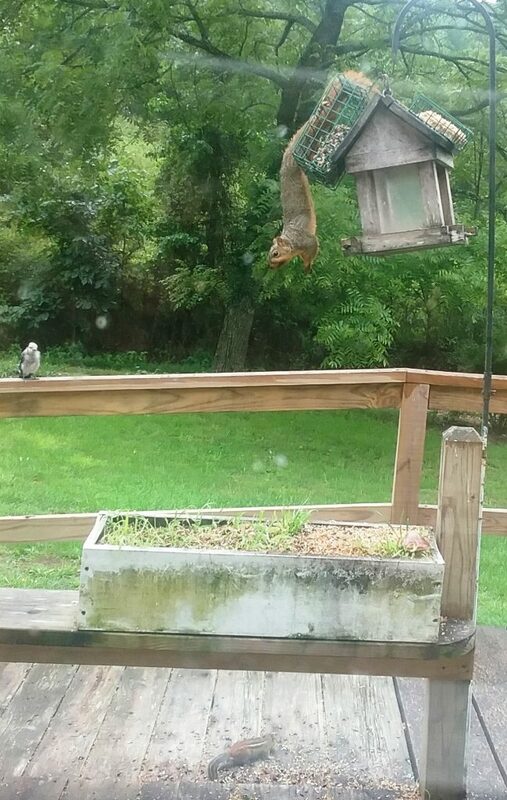 I assume he was just looking for cat food, but thinking him rude, I told him so and off he ran in surprise.